In these prepper times, a lot of people think about water storage and simply purchase a bunch of gallons of water. That works great for drinking, but what if you want everything in the house to work when there is no city water? In this short article, I will show you how you can do this for about $200, depending on the plumbing fittings. 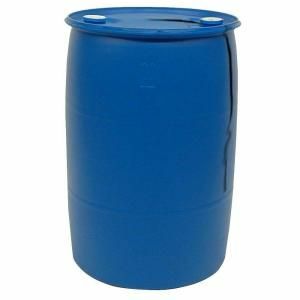 Used 55-gallon drums, food grade, can be found on craigslist for around $20 in most larger areas. Be sure you rinse them out well, one of mine had soy sauce in it originally. You'll need 1 or more of these. Next, you need to make sure the shutoff valve for the water in your house is turned off, it's very important otherwise you could leak water back into the sprinklers or otherwise waste it. Then you will need the following. An RV water pump is the next item needed, this goes on top of the tank, and the input hose drops down inside the tank. For the output get 1/2" FIP to garden hose thread adaptor. Take off the cold water line to the washing machine, put in a garden hose WYE and hook that up to the pump using a potable water hose. This will pressurize the cold water system, and will actually back feed into the hot water system too. Remember that you don't have to have this hooked up at all times, you can run the hose from the pump to the washing machine line in times of emergency. When the water goes out, turn off the value to the house, hook up the hoses and turn on the pump. Now, this is a very simple setup, yet it actually provides water to the entire house. In a long-term outage, you'll need to charge up that battery with solar, or using a vehicle on occasion. Also, it's a good idea to put bricks in your toilet tank to reduce the water per flush, and take the hose out of the filler tube, and drop it in the tank. This will use as little water as possible per flush. In my system, I have 2 55 gallon tanks plumbed together inside, and an additional tank as extra water that I can pump from if needed. I have 2 additional tanks that can be tossed in the back of the truck and filled up and I have a utility transfer pump that I can use to pump from the truck, into my tanks. I keep a 5' long metal ruler next to the tanks to measure how much water I have left. If you do set yourself up a system like this, make sure you check some of our other articles about water purification and safety. If you have a leak somewhere, you'll also know it because the pump should only turn on when you are using water. It important to install and test your system before you need it. Legal Notice : Some links refer to amazon using an affiliate service which the author may receive compensation from. Backfeeding through washing machine port is brilliant. It's so cheap to set up too, With a long enough hose, you could put the tanks in a closet, or garage (semi-heated). If it's survival mode, who cares about the garden hose running across the living room to the washer. @dontgive I keep them inside the house, except the filler tanks, which are empty and it doesn't matter if they freeze. This is actually how my house has water, the well died on me and I'm waiting for it to be deepened. The laundry machine works, shower, toilet, sinks, basically everything works. Even the outdoor spigots (the ones coming out of the house) work. Been like this a year, and other than fetching water all the time, it's not bad. It works! I guess the neatest thing is when the power goes out, I usually take a shower (because that's it for hot water). I can still cook and clean, while everyone else is S.O.L. Never heard of this, good one. Do you keep the tanks outside? How would one keep them from freezing?